P and D Barn Floor Grooving offers worry-free traction for your cows. Call 608-225-3595 for a free no obligation price quote. How long will the grooves last? Is concrete grooving cost effective? Why is grooving the most effective solution for slippery concrete? Why not use acid treatments? What additional benefits will grooving provide? What patterns should I use for high traffic areas and around corners? Which directions should the grooves be cut? What pattern should I use for sloped areas? What preparations are required prior to us grooving? Why choose grooving over scabbling? What kind of clean up is there with grooving? Varies depending how often you scrape and if you use a metal bucket or rubber tire. Average 5-10 years. Grooving provides the quickest and most cost effective service you can provide your cows for slipping and falling. Typically If you lose one cow the grooving would have paid for itself. We cut concrete with precision made diamond blades. Our equipment cuts grooves with sharp 90 degree edges which allows cow hoofs to catch and keep them from slipping and falling. There is ample flat area so there will be no foot problems due to uneven concrete. Why not to use acid treatments? This treatment is only a temporary fix. Acid eats away the top layer of your concrete, which could cause foot problems and weaken your concrete over time. Always remember when using acid to not inhale the fumes. As with scabbling, this is a temporary fix and time consuming. Unlike grooving, this process will need to be repeated frequently. What other benefits does grooving provide? There are numerous benefits of grooving. Grooving has been acknowledged by leading Universities and industry leaders to be the best solution for slippery concrete. Grooving reduces injuries, increases milk production and increases heat detection. Grooved areas will tend to drain better as well. Varies depending on the area we are grooving. We average 500-700 sq. Ft. Per hour. 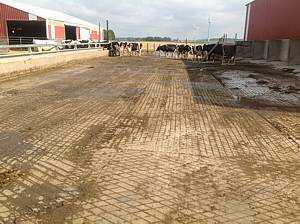 Anywhere your cows slip- alleys, yards, water pads, pens, return alleys, parlor decks. What pattern should I use for high traffic areas and around corners? Diamond or square pattern. Diamond pattern is grooving one direction and then coming back grooving a second direction at approximately a 45 degree angle. Square pattern is grooving one direction and then coming back grooving a second direction perpendicular to the first. Which direction should the grooves be cut? Grooves should be cut in the direction of the cows travel due to the splitting of their hind legs. If additional traction is needed, we will cut a multi-directional groove. 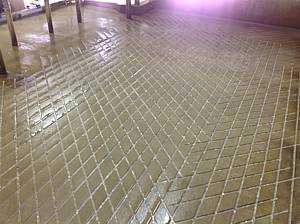 IA criss-cross or diamond pattern is the preferred method of grooving. What preparations are there prior to grooving? The only things we need is for the areas to be scraped clean and water to be accessible. Everything else will be left up to us. Why should you choose grooving over scabbling? Scabbling beats the concrete and causes it to weaken. It provides a roughened floor that is uneven and has been blamed for hoof and foot injuries while only lasting for a few short years. Grooving cuts straight grooves at 90 degree angles and leaves the integrity of your existing floors intact so your cows will have worry-free traction. What kind of clean-up is there with grooving? 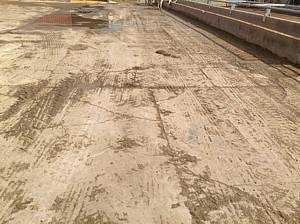 There is no clean-up after your concrete has been grooved. There is a slurry left behind that will either be cleaned during the next flush or the next scrapping. Links to Friends & Business Associates we highly recommend! Eliminate cases of mastitis with a Dairy Freestall Bedding Implement from SandstormerGroomer.com. Page Summary: P and D Barn Floor Grooving offers concrete groover, stall flooring, concrete grooves, barnyard grooving, scarifier concrete, cattle flooring, safety grooving, dairy floor grooving, groove flooring, dairy flooring and other safety grooving for stall and dairy cattle flooring in WI, IA, IL, MN, MI and CA.